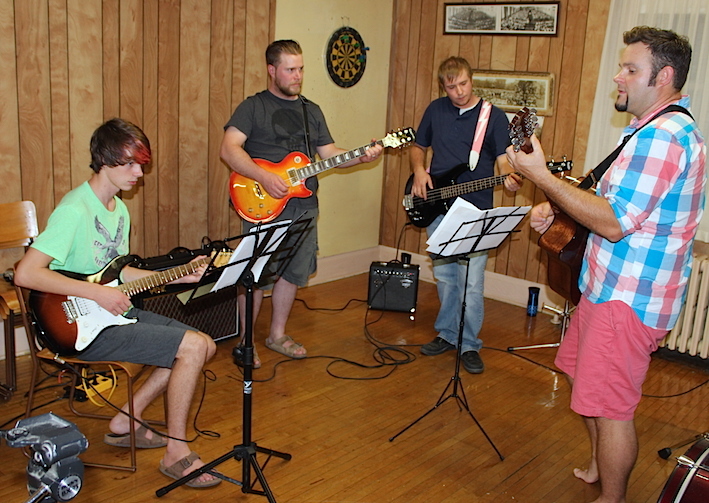 Adam Cyr, at right, jams with students James Alcock, David Mackechnie and Aaron Neeb in Rock and Roll Band Camp. EXETER – Four musicians hunch over their guitars, listening to Tragically Hip’s Nautical Disaster, a classic garage-rock song about mass death at sea during World War II. As lead singer Gordon Downie makes his way through the first 50 seconds, their fingers hover over the taut nylon strings, their heads bob and tilt to catch the cue. There it is: Downie says the magic words “…coast of France” and they jump into the song with two electric, one bass and one acoustic guitar. Feet pound, bodies lurch, heads rock. I think this is a magical moment, when four guys forget the world and just rock out, strains of their music wafting down the staircase and out onto Exeter’s main street on an otherwise quiet evening. I no longer make any of them self-conscious, scribbling notes and taking photos from the sidelines at this Rock and Roll Band Camp, part of Creative Huron’s Test Drive Your Creative Side. In this moment, I probably don’t exist and they’ve even forgotten they’re in the Odd Fellows and Rebekah lodge, sharing space with a dartboard, massive pool table and old black and white photos hung on the walls. They are lost in their guitars, and loving it. The band camp is led by Adam Cyr, who plays in local bands and teaches guitar, bass and drums and his business Joyful Sounds, which is based in South Huron. Tonight is the third session for his students, who are learning new techniques and cords, and jamming. As they play songs like Last Kiss by Wayne Cochran and Can’t Always Get What You Want by the Rolling Stones, Adam throws out tips and talks about things like “down, down, switch,” “1, 4, 5 blues,” “staying on the dots,” “doing some blues licks” and other things about which I know nothing. But his fellow guitarists nod in agreement and adjust their playing based on his instructions. Creative Huron’s Test Drive Your Creative Side is a comprehensive series of classes with a maximum eight hours of instruction, designed to introduce beginners to the arts. Classes led by local artists range from Latin dance to voice, watercolours to sound systems, needle felt to lantern making. Thanks to a grant from the Ontario Trillium Foundation, classes are just $20 each. There are still plenty of classes available to let you test drive your creative side. Give it a go. This series of classes is produced by Huron Arts & Heritage Network and the County of Huron Cultural Services Department along with partner arts organizations: Art aRound Town,Blyth East Side Dance, Blyth Festival, Elizabeth’s Art Gallery, Goderich Celtic Roots Festival, Goderich Little Theatre, Imagine Huron and Worth Their Salt. EXETER – As I left my car on a side street in Exeter on Monday night, the bells in the tower at Trivitt Memorial Anglican Church were ringing a melancholy welcome. 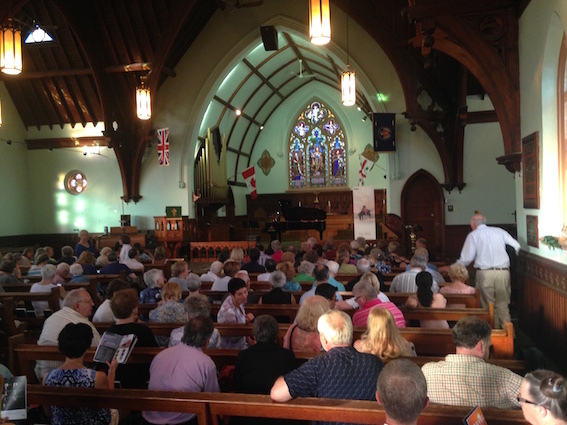 A few minutes later, South Huron’s third Bach Music Festival of Canada was opened by the chair of the board, Friedhelm Hoffman, with greetings from South Huron’s mayor, Maureen Cole. What followed was nothing short of splendid – an evening of exceptional music presented by the wildly talented Spanish pianist Leopoldo Erice. The concert began with Erice presenting a short lecture on his career, his appreciation for the music of Johann Sebastian Bach and his introduction to the musical part of the evening – the 32-part Goldberg Variations. I so appreciated this opportunity to learn more about Bach and his music from such a passionate and charming performer. Erice began by saying “a concert without an audience is not a concert at all” and he thanked the nearly sold-out crowd for attending the performance this night. “The audience is the receiver of the composer’s message,” and is, therefore, a key part of the event. A stately grand piano from D & S Pianos filled the stage so it was interesting to be reminded that in the time of Bach the piano had not yet been invented. The aria had been created for playing on a harpsichord with two manuals (or keyboards). Erice described the translation to the piano to be quite demanding as the crossing of the hands would become somewhat chaotic, “like Tom and Jerry running back and forth across the keys” (he was quite funny in his delivery.) At one point in the aria, on the piano, both hands play the same note so the musician gets to decide which works for him/her. Eric told the audience that the Goldberg Variations are said to have exquisite craftsmanship inspired by Bach’s devote Lutheran faith. It was created as part of Bach’s lifelong search for perfection. Further, Erice described the Goldberg Variations having much significance in its numbers. The 32-part Aria was created in 10 groups of three (with two parts repeated to reach the 32). There were nine canons or musical techniques employing a specific melody. And there were three parts presented in minors – #15 – (15/3 = 5) with the five having fear and sadness relating significance to the Virgin Mary; #21 (21/3 = 7) … relating to the seventh day when God rested and # 25 (5/5 = 5), a large homage, again to the Virgin Mary. The last variation #30 was celebratory. After a brief break, the concert began … approximately 90 minutes of un-interrupted, technically complex but none-the-less splendid piano music, presented by a consummate professional. Some pieces were easy-listening, some were delivered with more aggression and some with rapid staccato. The pieces created in minor keys definitely changed the mood as Bach has intended per this lecturer’s research. The triple standing ovation indicated everyone in the church that evening agreed this was a wonderful way to kick off the 2015 Festival that continues all week with evening concerts and Bach’s free Brown-Bag Lunch Series. The grand finale is St. Matthew Passion on Saturday night. Full details are available on the website. This piano originally belonged to Diva Karen Stewart’s grandmother’s. 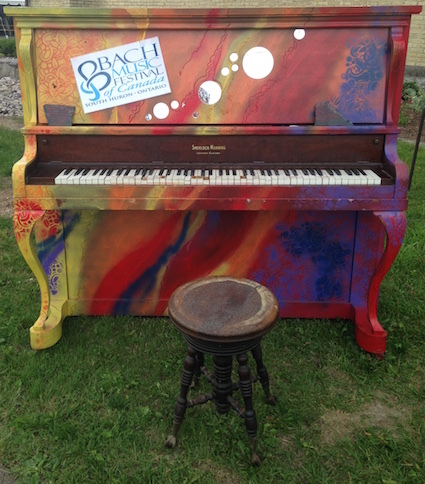 Karen donated it to Bach Music Festival in 2011 and an art class at South Huron District High School painted it. EXETER – Close your eyes and you can hear the organist tease resonating notes from cool air on the finicky pipe organ or feel the sound vibrate through your seat and into your bones from the digital organ during a lunchtime concert in the sanctuary of Trivitt Memorial Anglican Church in Exeter. 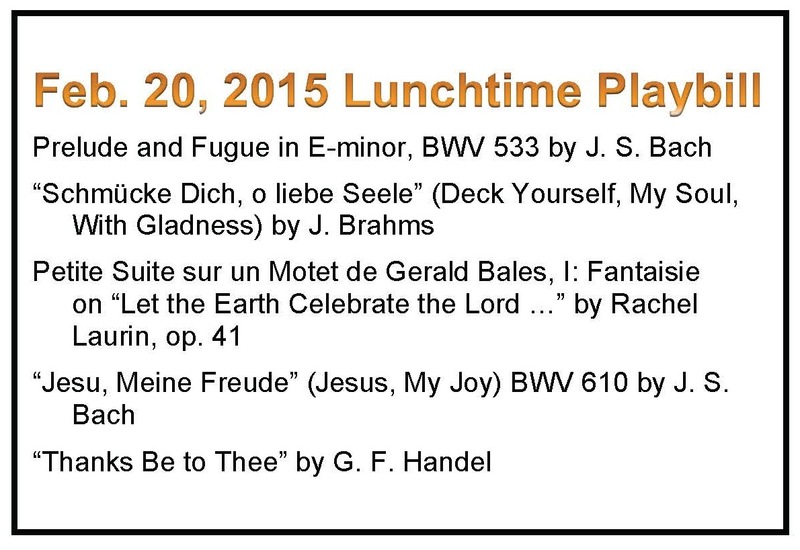 Dr. Richard Heinzle, organist and music director of Trivitt Memorial Anglican Church, hosts a lunchtime concert every Friday through Lent. to the sights in this magnificent church, built in 1888 and funded by Thomas Trivitt, Justice of the Peace in Huron County – the sun shining through stained glass scenes from the bible, Neo-Gothic architecture of tall narrow windows with pointed arches at the top and arched ceilings accentuated by wooden beams, the majestic bells that represent a full octave, which have temporarily been removed from the five-storey bell tower and line the church aisle. It’s your choice how to best appreciate 40 minutes of organ music in the church sanctuary. Since early 2014, Richard has been music director and organist at Trivitt Memorial Anglican Church in Exeter and music director of the South Huron Community Choirs, part of outreach efforts by the church. 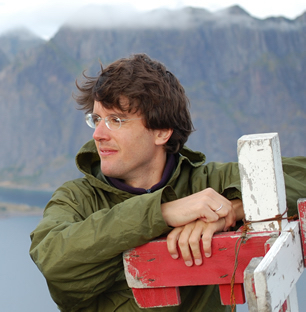 He is also a board member of the Bach Music Festival of Canada, which will take place in Exeter this summer. Richard introduces each hymn, telling us, for example, before he plays Bach’s Jesus, My Joy that most works were improvisational but the composer put together this piece in order to teach students how to improvise and to explore the different ways pieces could be put together. There are just two visitors to this first concert, but Richard was undaunted and hopes word will spread and more cushions will be filled in the coming weeks. He also wants people to know about the upcoming Hymn Sing Marathon planned for Saturday, Feb. 28 at the church. 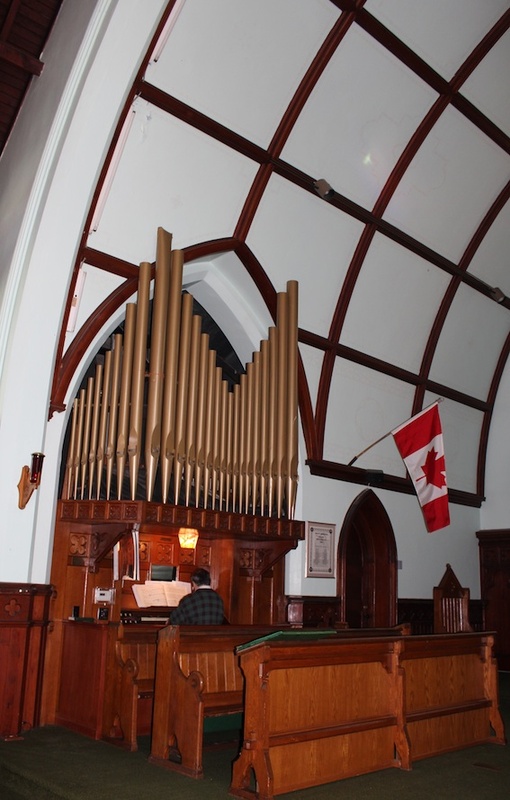 People are invited to drop anytime from 9 a.m. to 9 p.m. to make a cash or food donation to the Exeter and Area Community Food Bank and sing along as he plays through one verse of each song in the hymn book. He says many of the hymns in the Anglican hymn book are the same as in other hymn books, so you’ll be able to sing some familiar hymns as well as some new ones. 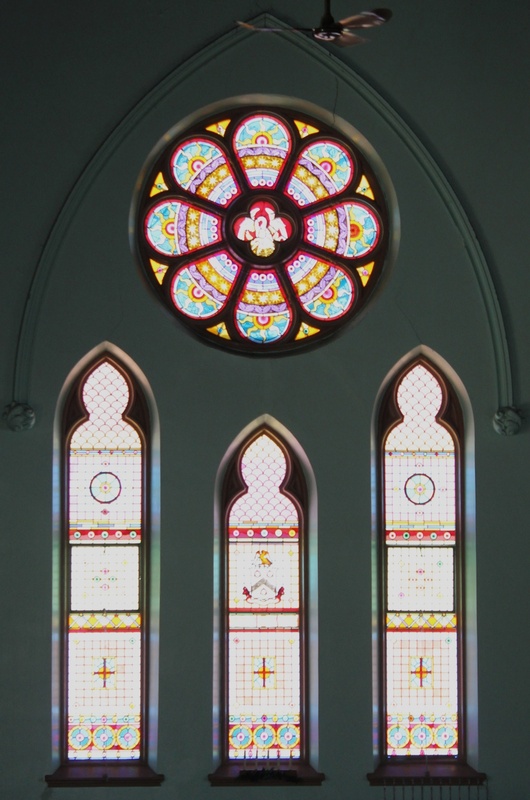 For more information on Trivitt Memorial Anglican Church, visit this website. When: Every Friday through Lent, until March 27, starting at 12:15 p.m. and ending at 12:55 p.m. It was a beautiful day for a rodeo, the sun was shining and there was not a rain cloud in sight. The afternoon was packed full of action with many different events to watch. We started the day off with an event called Pole Bending. It’s a timed competition where the ladies have to take their horses through six poles weaving them back and forth and racing back to the finish line. Tie down roping is also a timed event. 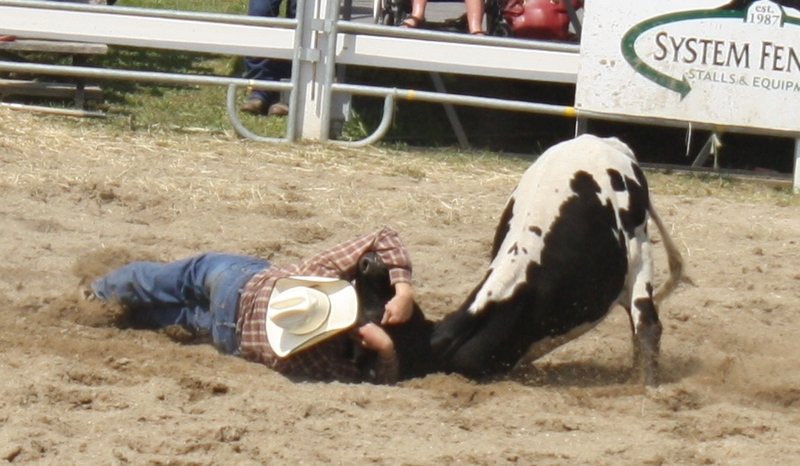 The cowboy gives the calf a head start out of the box and then has to throw his loop around the calf’s neck and get the horse to pull back on the rope, he then jumps off the horse, throws the calf on its side and ties up its feet. This was initially used to administer antibiotics on the farm before it became a sport. Break-a-way roping is a timed ladies event where she has to throw her loop around the calf’s neck and as the rope takes up the slack it breaks away and that’s when the time stops. Steer wrestling starts with the steer getting a head start leaving the gate, the cowboy then rides up on his horse to catch up and jumps off and brings the steer down, all four legs must be off the ground. His partner called the Hazer keeps the steer from veering away. Saddle bronc riding is a classic rodeo event. The cowboy must stay on his bucking bronc for at least 8 seconds to qualify for a score and he may only touch the bronc with one hand on the horses halter. The junior bull riding is for cowboys under the age of fifteen and they ride steers instead of bulls. They must also stay on the animal for a minimum of eight seconds to receive a score. Just before intermission we were treated to some ladies performing daring tricks on their beautiful horses, and the little ones got to participate in a sheep scramble where they were to chase sheep to get coupons off of their backs. Barrel racing uses three barrels and the cowgirls weave their horses around them in a clover pattern and races back to the finish line as this is also a timed event. If they tip over a barrel they receive a five second penalty. 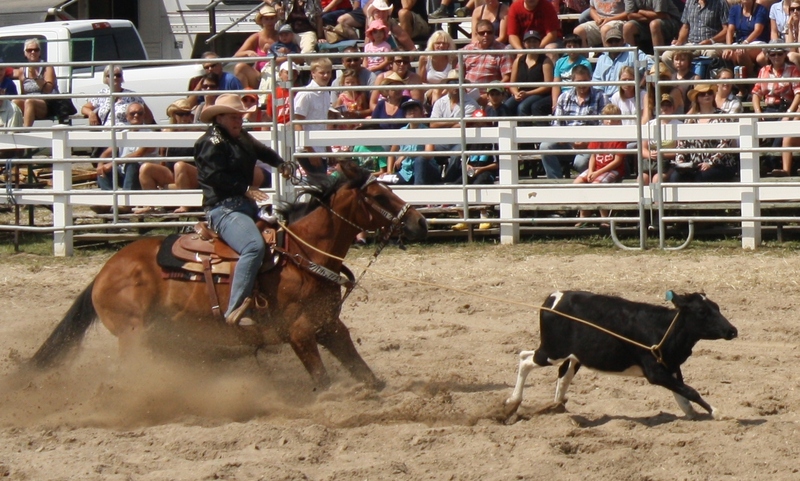 Team roping is similar to tie down roping, but there are two ropers. One is designated to rope the head and the other is to rope the back feet. If they don’t give the steer the appropriate head start they get a ten second penalty. Last but certainly not least is the adult bull riding, and this is what most people come to see. The cowboy is sat on a 2000lbs bull who wants nothing but to get this guy off of his back. The cowboy must stay on the bull for at least eight seconds. More points are awarded for the difficulty to stay on the bull for things like bucking, spinning and changing directions. So it helps to have an angry bull. It was wonderful to have such a big event so close to home and it looks like this annual event will continue for years to come. If you didn’t make it this year, make sure to come next time! 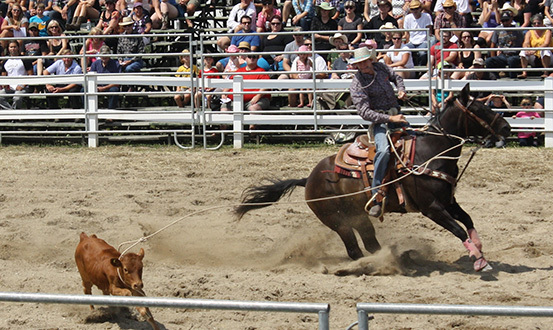 The Exeter Rodeo is an annual circuit rodeo event (http://www.ontariorodeo.com). Watch for 2015 dates at http://www.exeterrodeo.com or LIKE them on Facebook for regular updates. This was my first visit to the Huron County Playhouse II. I was quite pleased with the seating, being a short person I sometimes have difficulty seeing over people’s heads. There was a gentle slope to the floor and the stage was just high enough to see everything, but not strain the neck. There really isn’t a bad seat in the house. The set was well decorated, and presence of many rooms off of it gave it much more depth and allowed the play to expand. The actors worked very well together especially with some of the coordination they had to perform with timing and props. Overall everything came together very nicely and it was easy to get lost in the story. Synopsis: Peter Fisher is posing as the head of a British car company located in Berlin. There he is to await the arrival of a top industrial spy from East of Hans with a special package. His plans of a quiet birthday go out the window as he tries to keep his cover by juggling a wife whose plane is delayed, his mistress, a singing telegram girl and a senior inspector. Join this six crew cast in the cozy Playhouse II and find out how Peter gets himself out of this predicament. 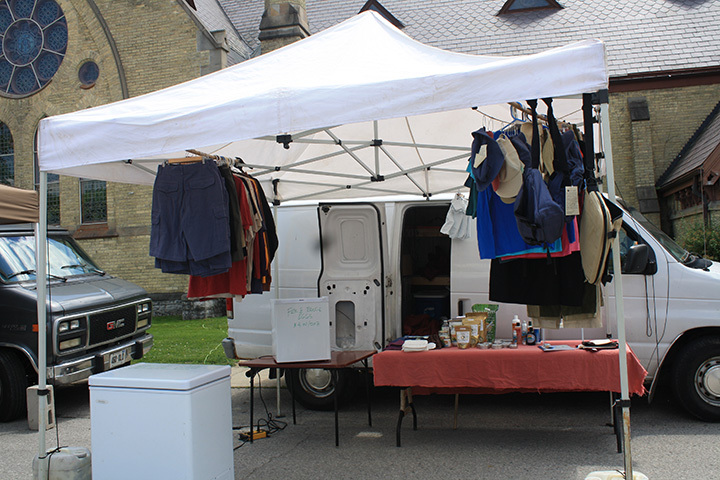 It was a beautiful day outside for a Farmer’s Market and I was lucky enough to meet all the vendors and talk to them. Here are the people and places I met on June 19th during my shopping trip to the market. Matt McIntire from Truly Local has a food truck set up and today his specials are Pulled Pork Sandwiches and Meatball Subs. Matt believes in using only local meat, he can tell you exactly where he has gotten his meat from that he’s serving that day and when it was butchered. 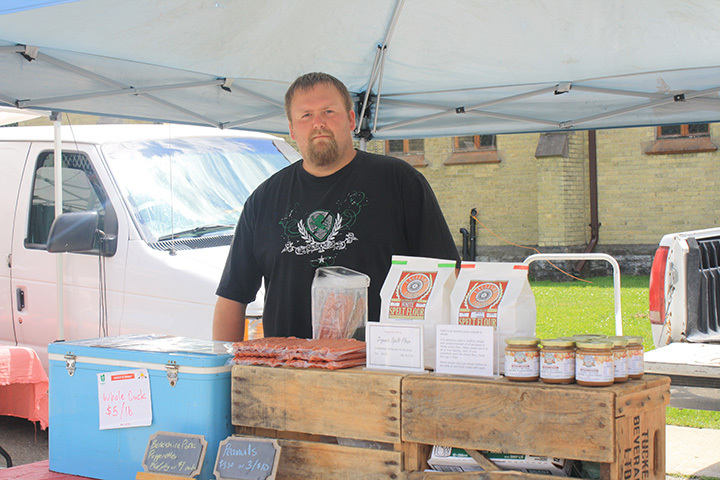 Matt Eagleson primarily sells beef, lamb and pork from his farm near Grand Bend. Most of their food is organic, or pretty close to it. They also have peanut products from the Simcoe area. Brent Holden sells Canadian made hemp products such as clothes, soaps, and seeds. He also has a variety of balms, bamboo towels and coconut oil. 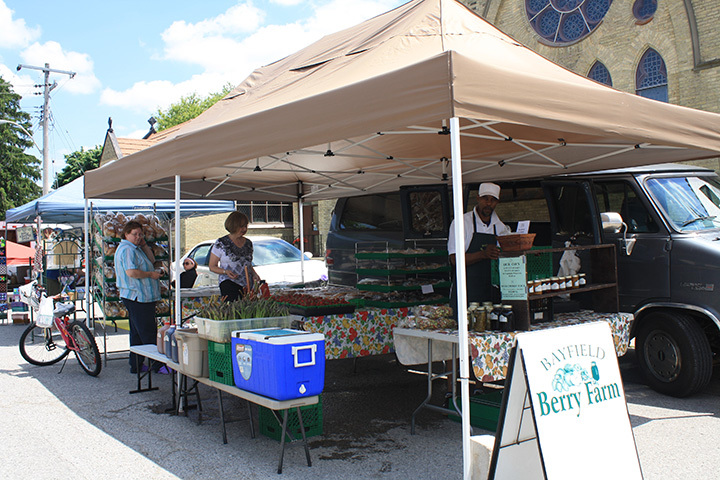 This vendor has a wide variety of items, ranging from produce to baked goods and canned goods. Today the strawberries are in season as well as asparagus and rhubarb. The pies and tarts look great! Sandra has a variety of crafts available for sale. She enjoys making canvas art, handmade jewelry, and she also knits and crochets items like dishcloths. Wally makes his very own jams, pickles and relish, all ready to take home at reasonable prices. Joanne and Dave Foster are from Kirkton and have been in business for 24 years now. Today tomatoes, asparagus and potatoes are for sale. They also have some beautiful planters and if you’re someone who enjoys growing their own food, they have heirloom tomato plants. 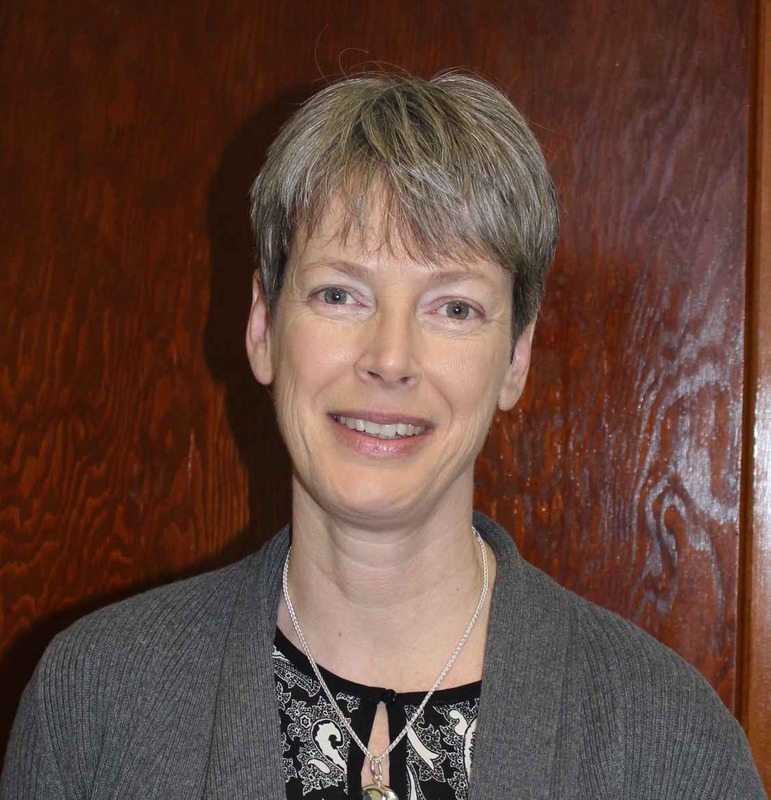 Look for Joanne on the cover of Rural Voice. 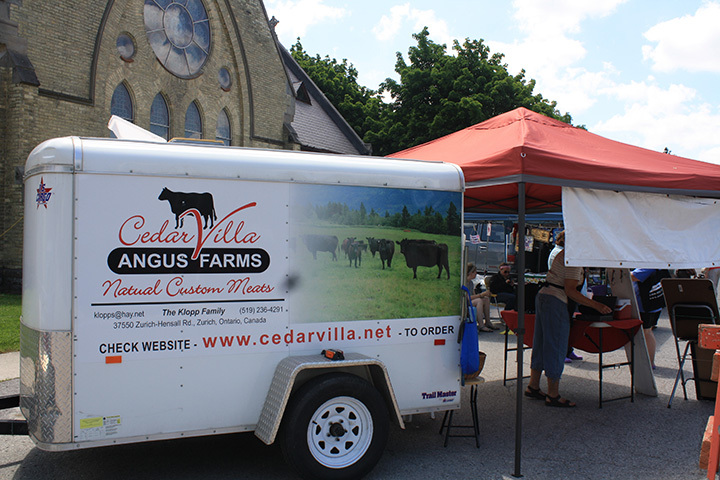 All the way from Niagara on the Lake this family owned and operated business joins our farmer’s market with five types of wine. They have been in business since 1993 and have won over 700 awards. Susan has many unique crafts in her booth today. She makes birdfeeders and what she calls dress-ups for the kids. She also makes handmade quilts, pillows and purses from used clothing. Kirk and Carol pick their produce the morning they come out to the market, so you know what you’re getting is fresh. Today Carol is selling peppers, cucumbers, cilantro, parsley, lettuce and garlic. She also makes baked goods from spelt, which you can also buy as berries to make your own goodies at home. Today she sells a variety of cookies and pies. Ray Sheldon from Lakeside Ontario is displaying some beautiful strawberries today. He tells me that they have raspberries in their greenhouses and blueberries will be ready for July. Ray is also selling honey, apple butter and raspberry jam. This 7th generation family farm from the Zurich area takes great pride in their products. Today they were selling beef roasts, pepperettes and beef jerky. You can contact them to place larger orders as well.